Route to the Hills is launching a new competition which will give you the chance to tell a story about Malvern's past. We are asking members of the public to tell us their ideas for an exhibition they would like to create which showcases a part of Malvern's history. From displaying historic pictures of old buildings, to creating paintings of a notable event, we are after your ideas on what history or story you would like to tell. Anything will be considered, as long as there is a clear link to Malvern's past, and we encourage you to think creatively in how you may choose to display this story. The winning entry will receive up to £1,000 to help cover the costs of producing the exhibition, and you will work alongside the Route to the Hills team to launch the exhibition before summer 2018. Applications will be accepted from individuals or groups (for example a school class, a poetry group, an artistic network etc) but you will need to be able to commit the necessary time to seeing it completed. We hope that by inviting applications from the public, we will extend the history that has been explored in Route to the Hills, and give people the chance to engage with local heritage as part of a fun project which will benefit the local community. All applications must be emailed or posted to Hannah by 12th March 2018, but if you have any questions or would like to talk through an idea, please don't hesitate to get in contact via the means stated on the application form. In December we were thrilled to have Hannah Boult join the Route to the Hills team as a work placement student. She will be with us until the end of March 2018, and therefore we have asked her to write a quick introduction to herself and the work she will be doing. Hi everyone! I am a final year student at the University of Birmingham where I am studying history. In my spare time I am also a British Red Cross volunteer where I help to run the British Red Cross on Campus Society at my University where we fundraise for different campaigns of the British Red Cross. As an intern I will be developing a competition for the best Malvern History Exhibition, where members of the public will be invited to submit ideas in order to try and win some funding to make their idea come to life. I will also be helping to organize some of the activities, as well as organizing a heritage skills day for families. I joined this project as I think its a really amazing, unique way to inform people about the fascinating heritage of Great Malvern. I also joined as in the future I would love to continue with my passion for history and work in the heritage sector, so this is a great experience for me. You may have noticed some of the route's new features being installed recently around the town. One of the project's volunteers - Simon Berry - undertook a mission to find and locate some of the new interpretation, in particular the small ground studs. Read below for his account of his exploration through the town to find them! I had heard that Route to the Hills had recently arranged for a series of studs to be embedded into the pavements of the route, showing pictures relating to the history of Great Malvern. My plan was to walk the route and spot all the different studs. I was prepared, having found pictures of the various studs on the Route to the Hills website. Carrying my pen and a copy of the informative booklet: Great Malvern An unusually excellent guide for curious explorers I set off from Great Malvern Station to walk the route and spot these mysterious pictures. Walking up Avenue Road, I was soon in luck. In great excitement I stopped abruptly on the pavement, narrowly avoiding colliding with two elderly walkers and a man with his dog. After apologising profusely I eagerly began ticking off the pictures in the guide book. Before long I had seen a Toposcope and a Nightingale (well at least pictures of them both) and was now immune from curious stares from passers-by. Into a near empty Priory Park I anticipated peace and quiet. It was almost empty of people. However, the park was full of noisy pigeons, quacking ducks and lively squirrels. I kept my eyes fixed to the ground and whichever way I passed the Malvern Theatres I was rewarded with more sightings of the studs, which I enthusiastically ticked off in my book. As I climbed towards the top of the park I enjoyed a glorious view over the theatres to the Abbey Hotel with the hills above everything. However, it was soon back to business, travelling through the grounds of Great Malvern Priory and onto Belle Vue Terrace. 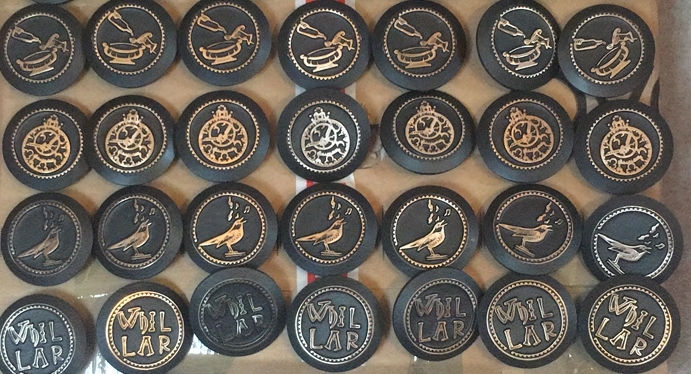 The studs included a variety of symbols representing amongst other things Morgan cars, Lea and Perrins Sauce and Gas Lamps. I arrived at the top of Belle Vue Terrace and walked to Rose bank Gardens to read the last of the Route to the Hills plaques and check my booklet. It had been a pleasant and reasonably energetic walk and I had found most of the studs, apart from the Astrolabe and the Radar Dish. The 99 steps to St. Ann’s Well awaited at the top of Rose bank Gardens but I thought today had been lively enough. Perhaps next time…. Recently we said goodbye to the project's first placement Michael Wheatley, who helped us over the summer holidays on developing some new short stories for children, Michael joined us from Worcester University where he is studying a joint honours degree in English Literature and Creative and Professional Writing. Below he shares his thoughts on his time working with us. Over the Summer, I decided to apply for a placement as a Creative Writing Intern for Malvern City Council in their Route to the Hills Project. As I’m currently studying English Literature and Creative Writing at the University of Worcester, I thought this would be a good challenge to flex my still-developing writing muscles, whilst also being able to contribute to the wider area in which I grew up. Having always enjoyed writing horror fiction, and stories with more adult themes, you can imagine my surprise when I found myself agreeing to not only write children’s stories, but also to read said stories live, to a group of children. However, I thought this would be equally as exciting as it would be challenging, and decided to throw myself headfirst into a new discipline, utilising my admittedly limited experience, and regretting not taking the ‘Writing for Children’ module in my second year of University all the while. However, I soon found the pieces were developing, and having a younger target audience to be altogether more freeing. Whereas in my usual pieces, 1000 words would hardly have got my character from one end of the street to the other, in these pieces they had already zipped around the Malvern Hills in race cars or written an entire novel from their bedroom. And the prompts provided, building off of Malvern’s rich history, were both stimulating whilst allowing me the creative freedom to create a story which I still felt was mine. As for the live reading, it was incredibly fun, and it was a hard to describe feeling (a bad sentence for a writer) when I saw the enthusiasm of the young children and their engagement with pieces I had created. Altogether, I found my time with the Route to the Hills project to be a fulfilling project; it challenged me to radically change my style of writing, and in doing so helped develop my skills and confidence in tackling new ideas, and I would recommend it to anyone who enjoys writing.